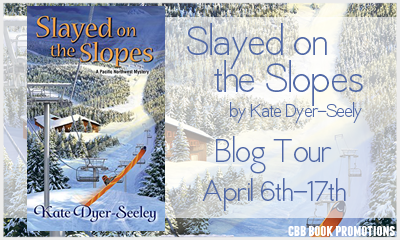 Welcome to my tour stop for Slayed on the Slopes by Kate Dyer-Seeley! 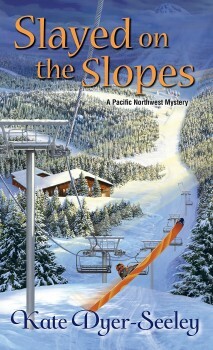 This is the second book in the Pacific Northwest Mystery series. Slayed on the Slopes released March 31st by Kensington Publishing. The tour runs April 6- 17 with reviews, interviews, guest posts and excerpts. Check out the tour page for more information. Please read on for a synopsis of the book, an excerpt, a review, and a giveaway! Don’t miss out on the first book, Scene of the Climb, available now! This series, in my opinion, has been a hit from day one. Meg Reed is one of my favorite contemporary characters in the cozy mystery genre. She has such an earnestness and sincerity to her that I can’t help but really like her. And, she reminds me a lot of myself at her age – charmingly naive (if I do say so myself!). She has a passion for her craft that really comes through; especially since she is working for an extreme outdoor sports magazine when she certainly doesn’t fit the type! But she knows what she’s good at and she knows she’s an outstanding writer who can bring the readers to the moment – even if what she describes isn’t exactly her forte. In Slayed on the Slopes, Meg is writing a feature story about the Ridge Rangers – an elite high-altitude rescue team. To really get the inside scoop, she’s attending a four-day training with the group high up on the mountain. A blizzard imprisons the already isolated group in their hut thousands of feet above the lodge at Mount Hood. At one point, Meg steps outside into the blizzard and faces two very dangerous realizations: not only can she not find her way back to the hut, but what that a gun shot she just heard? Kate Dyer-Seeley has crafted a smart, crisp, and witty cozy mystery. Suspicions practically dances from a character to character; keeping me and Meg on our toes! What is really even more intriguing to me is the back story/behind-the-scenes mystery that is at work in the Pacific Northwest mysteries. Tiny pieces of something larger at work fall into play in both Scene of the Climb and Slayed on the Slopes. Truths that Meg thought she knew about her father, her family, and her job are suddenly being called into question – and she and my crush (ooops! I mean Meg’s crush), Matt, are inching their way into very, very dangerous territory. Slayed on the Slopes drops one bombshell of a cliff-hanger ending and, if you’re anything like me, you’ll be on the edge of your seat until the next Pacific Northwest mystery is released . . . in 2016 (sob!). My thanks to the author for gifting me a copy of this book in exchange for an honest review. I caught Jill’s eye. Her body was rigid, and not from her Pilates practice. She forced a smile and told me to go. Matt led me to the floor, clutching my hand in his. It felt good. Too good. The band played Etta James’ “At Last.” He pulled me close, wrapping his arms around the emerald green satin on my waist. I’m not sure if it was the melodic sounds of the band, the glow of a wedding, the candlelight, the cedar scent of Matt’s aftershave on my cheek, but I forgot about Jill, my head and Ben’s death, as Matt held me and we swayed in rhythm to the music. Time faded away in his arms. Everything felt normal, steady and blissfully off center at the same time. Matt gently stroked my hair as we circled the dance floor. I rested my head on his warm chest. When the music stopped, he didn’t release me. Instead he placed his hands on both my cheeks and bent his face toward mine. He tilted my chin. His eyes looked at me with a longing that I’d never seen before. I sucked in air. This was it. He was going to kiss me. My heart pounded. I wondered if he could feel it beating on his chest. Just as he inched his face closer to mine, a loud crash echoed throughout the room. He dropped his hands from my face as we both swung toward the sound. Malory stood a few feet away. She was covered in red sauce. A large, silver tray had splattered by her feet. Wait staff scurried with rags and a bucket of water to clean up the mess. Malory glared at Jackson who escaped the mess. He grabbed napkins from a nearby table and began dabbing Malory. She pushed him off and stormed out, leaving a trail of red streaks on the floor behind her. Jackson bent over to help clean up her mess. Matt broke the silence. “What do you think that was all about?” His face had returned to normal. Our moment had been lost. The band began to play again. Couples crowded the dance floor around us. I felt a twinge of regret that he didn’t ask me for another dance. “Sure.” I followed him from the floor. He didn’t take my hand this time. As we wound our way back to the table, we passed by the sheriff and Gam. She intentionally bumped her hip into mine. “Margaret! Isn’t this the best?” The lines around her eyes crinkled deeper as she beamed at me. “I’m glad you’re having fun, Gam.” I squeezed her hand. 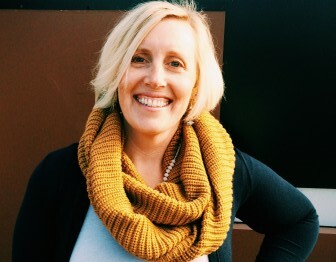 Kate Dyer-Seeley writes the Pacific Northwest Mystery Series for Kensington Publishing. The firstbook in the series, Scene of the Climb, features the rugged landscapes of the Columbia River Gorge and a young journalist who bills herself as an intrepid adventurer in order to land a gig writing for Northwest Extreme. Tour stop at Girl with Book Lungs courtesy of CBB Book Promotions – thank you! Wonderful review! I’m so glad you enjoyed this one! Thank you so much for hosting a tour stop and sharing your thoughts! sounds like a great series…….